Their are many books on the Triumph, but none written by a more authoritative writer than John Nelson, Service Manager at Triumph for many years. The book includes a comprehensive appendix giving specifications and key part numbers for every year of production up until the end of the model in 1986, and has such essential restorers information as colour schemes, cosmetic and mechanical changes, and a host of other information. Hardcover from Wolfgang Publications, Inc. Covers the Triumph Cub and Terrier, the scooters and many others, with specifications and history. Covers all TR6 Tiger and Bonneville models from 1956 to 1983, and includes information on model changes, engine and chassis numbers, part numbers and paintwork. An excellent and highly detailed book, essential reading for the collector and enthusiast. 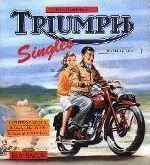 This is a complete guide to the history of Triumph, one of the most famous motorcycle manufacturers in the world, recounted by Ivor Davies, who worked for 30 years as Triumph's Publicity Manager. Siegfried Bettman, founder of the marque, tells the early history of the company in his own words. Covers all post-war models including Speed Twins, Tigers, Bonnevilles, Tridents and specials. Includes a section on the Hinkley Triumphs.